Ron, with the construction of the Northern State Parkway in the early 1930s, Robert Moses agreed to build two Motor Parkway bridges over the new parkway, one just west of Lakeville Road and another west of New Hyde Park Road. At this section of the Motor Parkway, the right-of way did not cross the Long Island Expressway. Here's the amazing supporting photos. 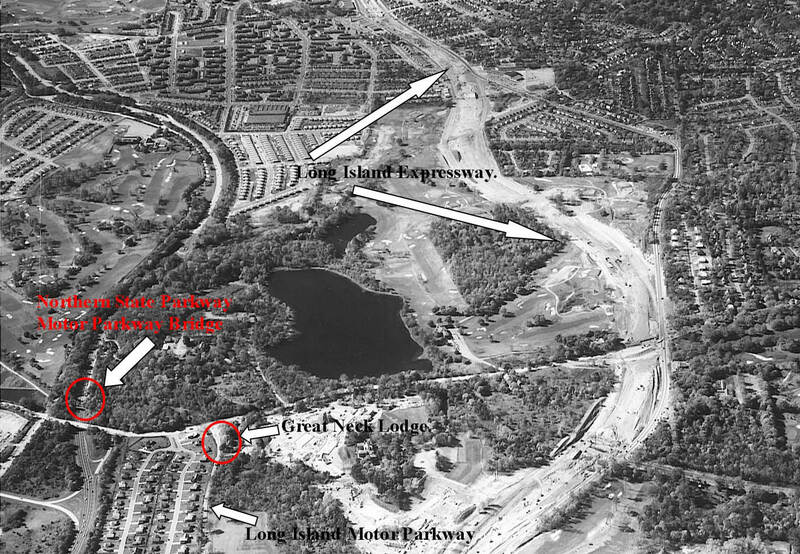 In the above photo, the Motor Parkway Bridge near Lakeville Road is being built in the early 1930s. Note: A car has fallen into the excavation and is being hauled out by a tow truck. 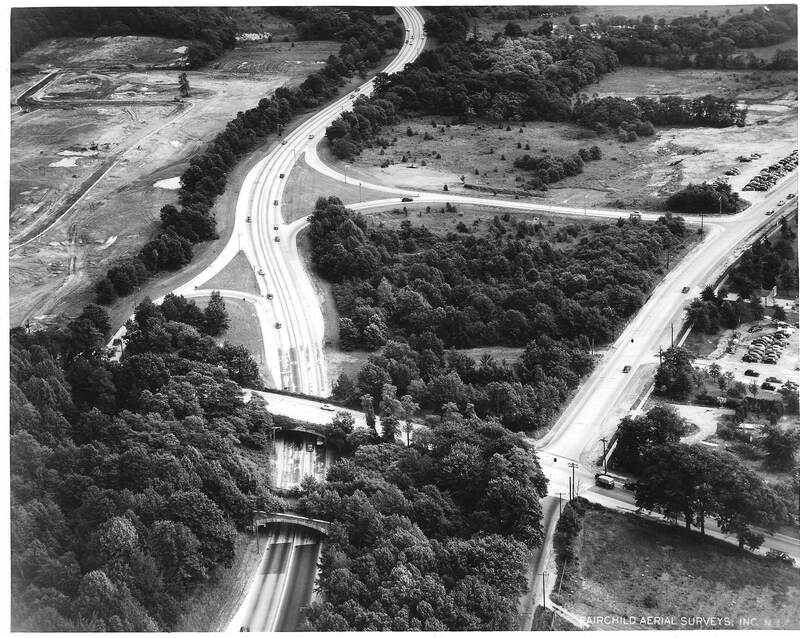 This 1952 photo is looking east and shows the first Motor Parkway Bridge over Northern State Parkway in Lake Success and its sister Lakeville Road Bridge. Note: The bushes and overgrowth on the Motor Parkway Bridge which had closed 14 years earlier. This 1955 aerial shows the entire area looking north. Note the positions of the two Motor Parkway Bridges. Even, the small farmway bridge on Old Courthouse Road (still standing today!) is documented in this aerial. Okay, Long Island Expressway fans, here is a keeper. 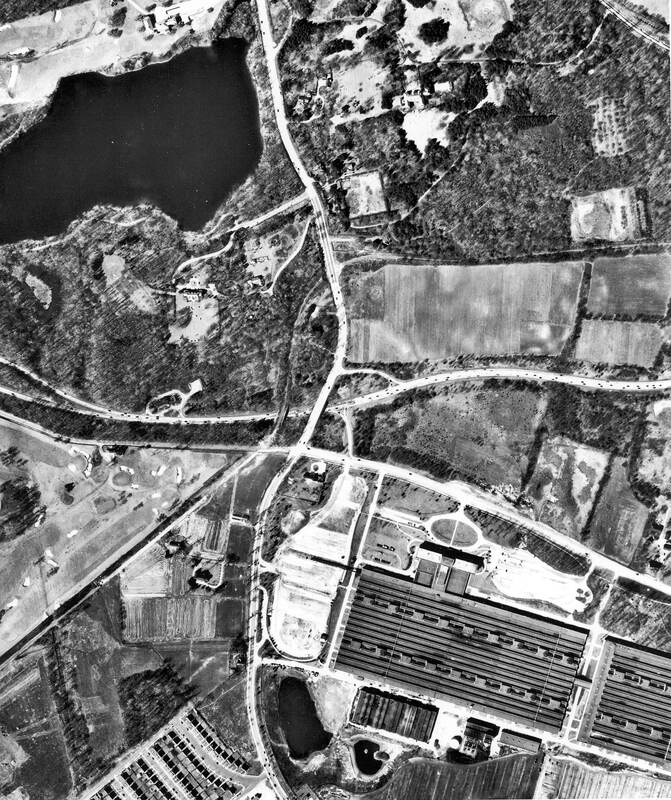 This 1956 aerial looking west shows the LIE being built in Lake Success. Note: The Long Island Motor Parkway makes a turn to the east before the Long Island Expressway. The Motor Parkway right-of -way does not cross the LIE until it reached Dix Hills in Suffolk County. With the widening of the Northern State Parkway in the early 1960s, it was finally time for the two Motor Parkway Bridges to come down. This is a close-up of the first Motor Parkway Bridge. Note: It had the same design as the Lakeville Road Bridge in the background. This was the second Motor Parkway Bridge being torn down near New Hyde Park Road. Although the bridges were destroyed, remnants still exist today. 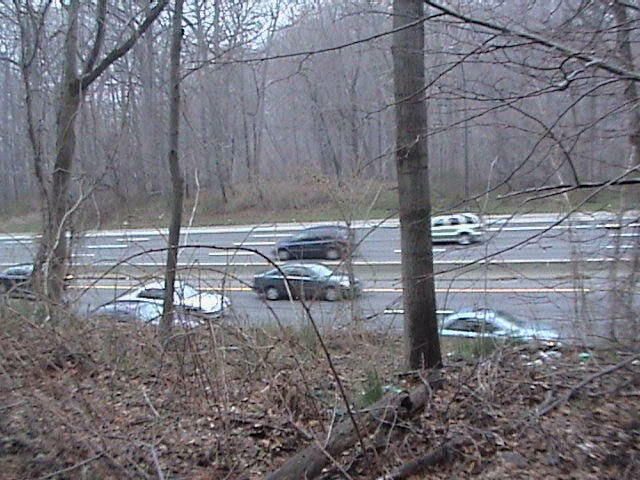 This 2005 photo shows the view from the southern abutment of the Motor Parkway Bridge near New Hyde Park Road. Howard, as always, I love your website. 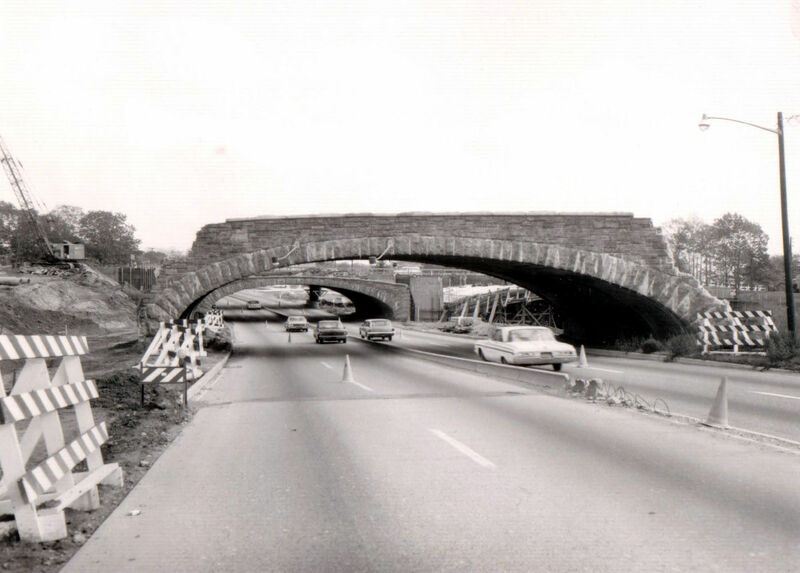 Do you have any aerial photos and or pictures of the LIMP bridge at Old Searingtown Road, formerly Manhasset Avenue. 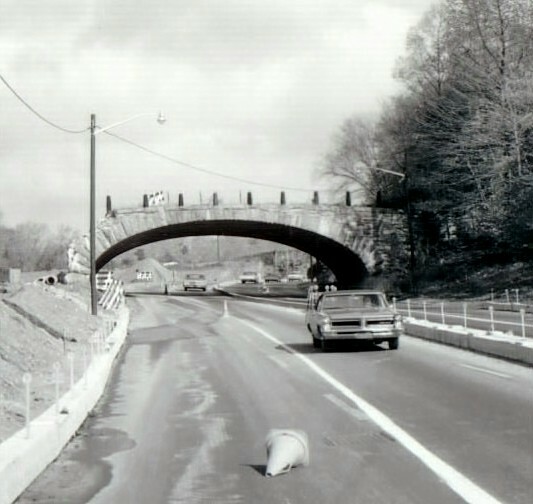 I have never seen a picture of the bridge at Old Searingtown Road. I had worked out of the State Parkway Police barracks on Northern State Parkway in the late 1950’s, which was located on the north side of the Parkway just west of Lakeville Road and the Motor Parkway bridge, and just east of the city line. I have never seen, or been able to locate a photo of this barracks, but it was a beautiful stone structure and I was told it was originally a hunting lodge as part of William Vanderbilt’s Deepdale estate. In the 1950 aerial photo you posted, the barracks is located in a horseshoe shaped paved area directly south of Lake Success and Vanderbilt’s mansion, and directly north of the golf course pictured on the south side of the Parkway. 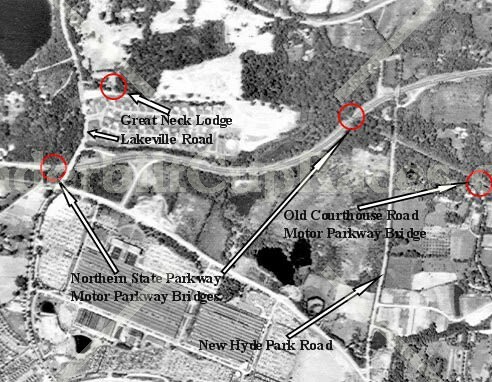 The 1956 aerial looking west also shows where the old police barracks was situated. Joe, unfortunately, I have never seen a close up of the Old Searingtown Road Bridge. Maybe a LIMPer out there can send in a photo. Tim, I believe you are correct that this building was originally part of William K. Vanderbilt, Jr’s Deepdale Estate. I have a closer look of the building in another aerial and believe the Suffolk County Vanderbilt Museum have some ground-level photos. I will further address these two areas with photos in future posts on VanderbiltCupRaces.com .